Brașov (Romanie pronunciation: [braˈʃov] ( listen)); Hungarian: Brassó) is a coonty (județ) o Romanie, in Transylvanie, wi the caipital ceety at Brașov. The coonty incorporates athin its bundaries maist o the Medieval "lands" (țări) Burzenland an Făgăraș. In 2002, it haed a population o 589,028 an the population density wis 110/km². Traditionally the Romanie population wis concentratit in the Wast an Sooth-Wast o the Coonty, the Hungarians are in the East pairt o the coonty, an the Germans wur in the North an aroond Brașov ceety. The coonty haes a total aurie o 5,363 km². The Sooth side comprises the Carpathie Muntains (Soothren Carpathians an Eastren Carpathians) wi Făgăraș Muntains, Bucegi Muntains, Piatra Mare Muntains, Piatra Craiului Muntains an the Postăvarul Massif. In the east side there is the Brașov Depression, an in the wast side there is the Olt River valley. Atween them there are the Perşani Muntains. The North an Wast side o the coonty is crossed bi the Olt River. Covasna Coonty in the East. Sibiu Coonty in the Wast. Mureş Coonty an Harghita Coonty in the North. Argeş Coonty, Dâmboviţa Coonty an Prahova Coonty in the Sooth. Braşov is ane o the maist prosperous regions o Romanie an haes a tradition in industry. Durin WWII, IAR 80 an towards the end o the war Bf109, fechter aircraft wur built in Braşov. Durin the communist period it wis hivily industrialised, an its heritage wur some vera lairge industrial complexes. Some o them managed tae survive an adapt tae the caipitalist type mercat economy, some o them didna, leavin ahint them a heich rate o unemployment. Due tae new investments, mainly foreign anes, the economy managed tae pairtially recover. Aroond Victoria there are big chemical complexes which pollute the region. Braşov contains some o the maist attractive tourist destinations in Romanie. Bran wi its castle aften referred tae as Dracula's castle. The medieval fortresses o Făgăraş an Râşnov. The Fortifeed kirks frae the Saxon veelages in the Burzenland aurie. 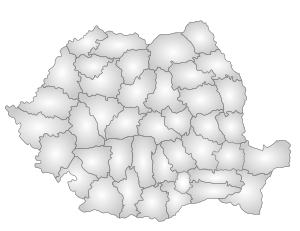 Wikimedia Commons haes media relatit tae Brașov County. This page wis last eeditit on 13 Mey 2014, at 07:12.